Rosacea is a skin disorder. It causes chronic redness of the face. It can also cause swelling, tiny pimples, and the appearance of broken blood vessels. 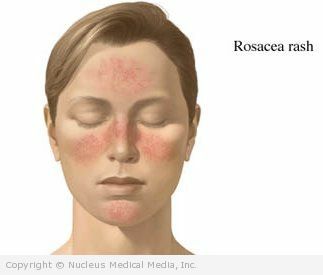 Rosacea usually affects the cheeks, forehead, chin, and nose. The ears, chest, and back may also be affected. More than half of people with rosacea also have mild eye symptoms. This may include redness, burning, and watering. This is known as ocular rosacea. The cause of rosacea is unknown. Several theories exist. Factors that can cause flushing or blushing may trigger flare-ups in people with rosacea. Your doctor will ask about your symptoms and medical history. A physical exam will be done. Your skin will also be examined. You may be referred to a doctor who specializes in skin disorders. This type of doctor is called a dermatologist. Do not try to diagnose or treat yourself. Certain over-the-counter medications could make your condition worse. Rosacea generally can’t be cured. It can be controlled. There are several ways to manage rosacea. Your doctor may recommend more than one, depending on your condition. *Topical cortisone is generally avoided on the face. It can make rosacea worse in the long run. It can be effective as very short-term treatment. Avoid things that may trigger flushing or blushing. This includes certain foods, alcohol, and exposure to the sun. Protect your skin from the sun. Use clothing, hats, or sunscreen with a sun protection factor (SPF) of 15 or higher. Exercise in a cool environment to avoid overheating.